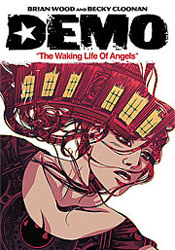 It's the second coming of Demo, with Brian Wood and Becky Cloonan's well-received original series of self-contained stories finding new life with a new publisher. Originally sent to press by AiT / Planet Lar, the Eisner nominee's publishing rights have recently reverted to its creators, who promptly chose DC's Vertigo imprint as their new home. Now, alongside a bells-and-whistles collection of the original series, the pair is back to launch the book's second run. For the uninitiated, Demo is a series that primarily concerns itself with single issue storylines, following the lifestyles and interpersonal relations of a broad range of characters. It's part slice-of-life and part sharp introspection. If the primary character in your first issue doesn't strike a chord, there's a good chance the centerpiece of the next edition will. Brian Wood had originally planned to tie the whole series together by granting each figure a special ability – ok, super power – but as the series wore on and Wood's interests changed shape, that direction was cast away. This month, that lead is faced with a different sort of crisis. Joan, a thirty-something office worker in San Francisco, hasn't slept in over a week. She's not coming to grips with her sudden ability to fly or lift a car above her head, but rather keeping her distance from a recurring nightmare that's intruded her waking life. Everywhere she goes there's a vivid reminder of something lifted directly from her nightmare, some more specific than others. Wood's storytelling fully embraces the blurred, hazy line between dream and daylight, shifting our perspective with every page until we're never sure if Joan is seeing something real or imagined. The sense of vertigo, for lack of a better word, is extremely effective, and by the end of the issue I felt like I was badly in need of a nap myself. Of course, that fantastic element of Wood's storytelling would have probably gone unnoticed without an equally dedicated investment from his artist. Becky Cloonan, fortunately enough, proves more than up to the challenge. Her work, presented in stark black and white, steals your attention without demanding it. The lack of color lends a touch of indie credibility, but it also forces her to do more with less and she proves perfectly adept. She quickly establishes two slight variations of her style, one for when we're dreaming and another for when we're awake, and then almost immediately starts to blend the two together. Its effect in furthering the allusions Wood makes in the story is unmistakable. Demo was a nice surprise. Its slow, casual pace may be a bit too off-the-beaten-path for some, but the earnest storytelling and razor-sharp artwork will make it difficult for anyone to turn away. There's actually very little in terms of actual plot in this issue, but Wood's focus on the details and the constantly shifting focus between dream and reality gives it more than enough substance to last the entire length of the issue. The new Demo is a very quick read, but it delivers more depth than many others can manage with thirty pages packed to the breaking point with dialog. Buy it.